After the proverbial roller coaster at Barnsley in the league cup on Wednesday night, Everton travelled to Spurs for the Saturday evening game. The match wasn’t a classic by any means, with both sides largely canceling one another out. The first half drifted along without either side particularly threatening. Neither Everton nor Spurs were able to produce enough good service to their strikers with Lukaku and Kane both cutting isolated figures as the midfield battle went on. The middle of the pitch was very congested, and with Kone and Cleverley occupying advanced wide areas, Everton were unable to exploit spaces out wide with neither players game best suited to offering their side width. Barkley who has been looking good from deep was too advanced, trying to support Lukaku who Everton didn’t manage to get in the game enough, and when they did, it wasn’t the best of days for the Belgian hitman. As we can see from the picture, however, had Cleverley been able to look up and see Kone before shooting, he could have played the Ivorian in for a great opportunity on goal. Cleverley forced a relatively comfortable save from Spurs skipper Hugo Lloris, who tipped the ball away for a corner and the chance was gone. Everton lost the ball cheaply with Oviedo down the left wing, and with both fullbacks advanced, Kane was covered only by the Everton centre half pairing of John Stones and Phil Jagielka. Ryan Mason plays a superb through ball for Kane who pulls away, and would draw a good save from Howard. The worry from an Everton perspective is just how high a line we’re playing and how exposed it leaves us. For a chance like this, communication is key between Jagielka and Stones, and from a technical point of view, Stones is the one who should be taking control in this situation. Being the right sided centre half, Stones can see the only goalscoring threat (Kane) and the pass being played. 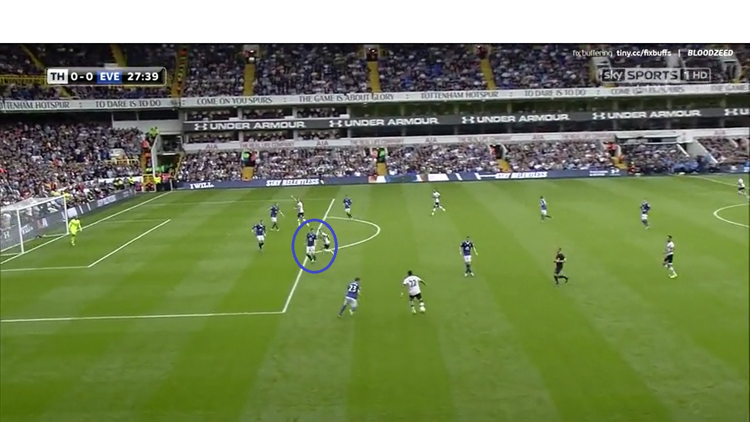 Jagielka can only see the ball being played (with Kane behind him), and is reliant upon Stones. 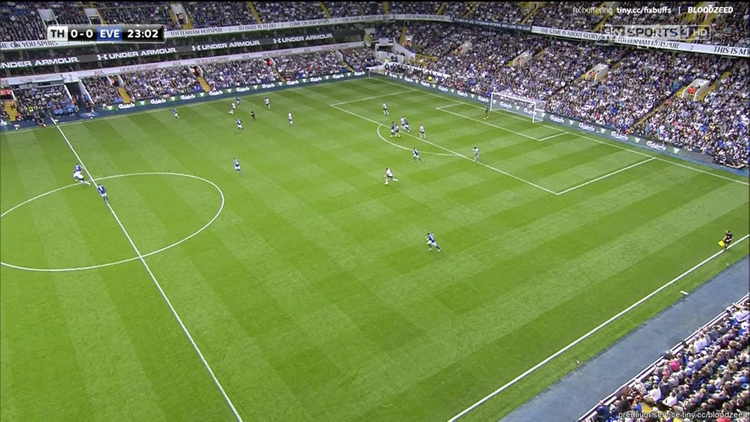 As the pass is played, Stones steps up and Jagielka steps back to cover the run, leaving Kane onside to break away. It should be said, I don’t know whether Stones has told Jagielka to step up with him, nor do I know whether Everton are coached to have their centre halves to step up and defend the half way line in this situation or not. Either way, the communication between the pair isn’t good enough: they aren’t on the same page here, and as a result, Spurs should be one nil up. The way we set up to play, we’re always going to be vulnerable to moments like this on a quick break, but with better communication this particular chance was avoidable. 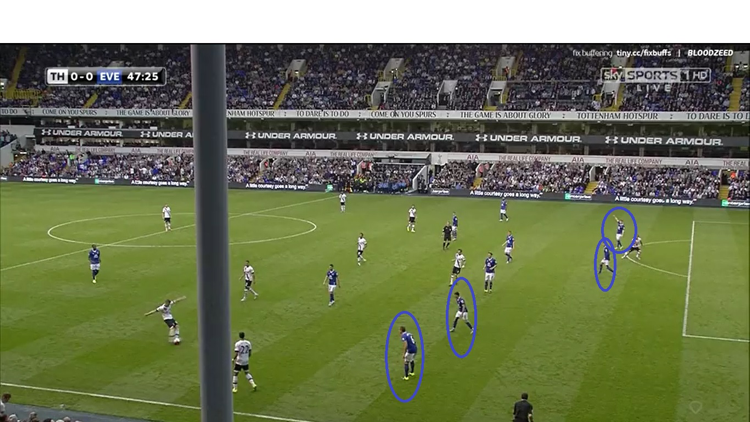 Mason’s run at this point is being tracked by Gareth Barry (both circled) and had that continued to be the case, Chadli would not have been able to slide the ball into Mason. Inexplicably, Barry (circled) turns his hips the wrong way and finds himself totally squared up and unable to move as Mason ghosts in behind him. John Stones is left scrambling to cover for Barry but was unable to get there in time to prevent the shot on goal. Had Chadli been turning inside without both Seamus Coleman and James McCarthy in decent positions to halt any further progress towards goal, Barry would have been right to try to square up and challenge the ball, but why he’s done it here, I don’t know. We rely on Barry to cover opposition midfielders and protect us in front of the defence, but this was a poor moment for the ex- England international, and Everton are now fortunate to not be losing at this point. Before half time came, Everton suffered an injury blow with Tom Cleverley being stretchered off under a heavy challenge from Eric Dier from behind. Hopefully it won’t be too bad an injury, Cleverley having impressed since his arrival in the summer. His hard work and thoughtful play as he ties things together in the Everton midfield will be a miss. Circled are the Everton back four with Phil Jagielka in a position at left back having followed the run of Nacer Chadli across the pitch, Bryan Oviedo inside of him and then John Stones and Seamus Coleman six or seven yards deeper than everyone else, almost playing Harry Kane onside. Off the back of the Man City game, we spoke briefly about the difference in the organisation of the Man City back line when compared with Everton’s (you can find that here). Although Kane was offside here, clearly the same problems remain. But this is mind numbingly bad. Correctly ruled offside, and the opportunity gone. Spurs continued to create half chances, but weren’t exactly forcing themselves on Everton, either. Without a real dynamic creative force they weren’t really opening Everton up. In this picture we can see how Kane has managed to find space on the edge of the box for a shot despite there being eight Everton players back in shot. Each Everton player had retreated deep and nobody had thought to stand on Kane who, despite struggling, was always likely to be their most threatening player. This again is a worry, he shouldn’t have that much space from a simple break. There are enough players back to be able to deal with this better. Sound familiar? From back against Watford on the opening weekend, poor marking has meant Everton should be in a position to deal with the danger posed by the opposition, but ended up going one down. Fortunately that wasn’t to be the case at White Hart Lane, but it is frustrating to see the same simple errors still creeping in. Circled is Jan Vertonghen who has brought the ball up into the Everton half totally unchallenged. In space, he sees the run of Danny Rose and threads a ball between Kone and Coleman. The chance didn’t come to anything for Spurs with Rose cutting the ball back to Dele Alli, who would go on to dive having been challenged by John Stones, and Everton eventually managed to clear. This chance was a sign of the limitation of the way we’re set up to play with our personnel. Kone isn’t used to playing wide and isn’t suited to it, especially when we’re not in possession. Kone had looked over his shoulder to see where Rose was but just didn’t appear to react to the danger and allowed him a free run in behind. Kone actually played quite well yesterday, and could’ve (should’ve?) pinched a goal with less than twenty minutes remaining. Having been moved more centrally after the substitution of Lukaku, Kone drifted wide, held the ball up and set up an attack. As the ball was worked from right to left, eventually finding Oviedo, Kone had continued into the box and managed to glance a header on Oviedo’s cross. A rare moment of quality in the final third from Everton and it was as close as either side would go. Encouraging play from the Ivorian who is enjoying his first real run in the side since his move from Wigan in 2013. The game came to a quiet end, nothing of note really happening after the Kone header, and that was that: a decent away point. Spurs will feel they did enough to win it, but there wasn’t much between the two sides. A couple of defensive things we can continue to work on, but we have to find a way to get Lukaku and Barkley more involved and making sure the service into them means they can do their best work in the areas they’re most comfortable in. Between them, they didn’t touch the ball a hundred times against Spurs- in our best performance of the season to date (against Southampton) Barkley alone touched the ball 75 times and was able to have a huge impact on the game which benefited Lukaku no end. Chelsea up next. That should be interesting.